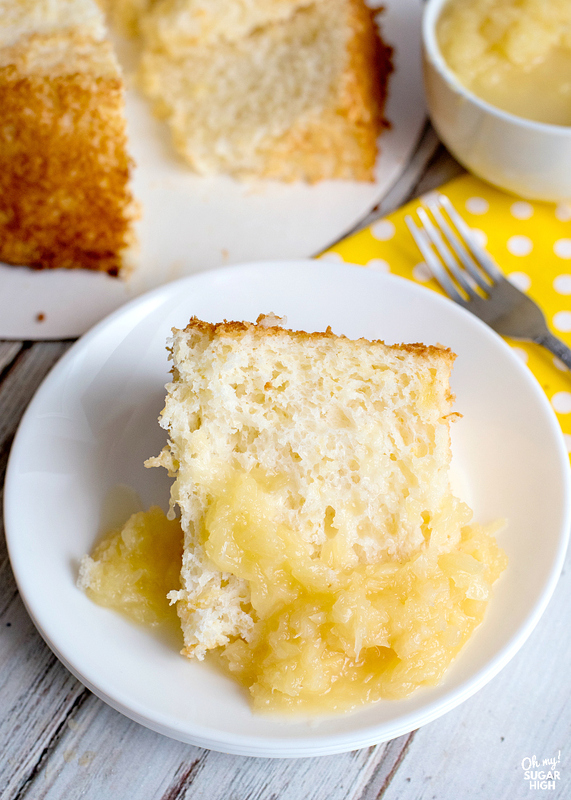 Pineapple cake is the stuff dreams are made of, especially if you are looking for a low calorie, low fat dessert option! 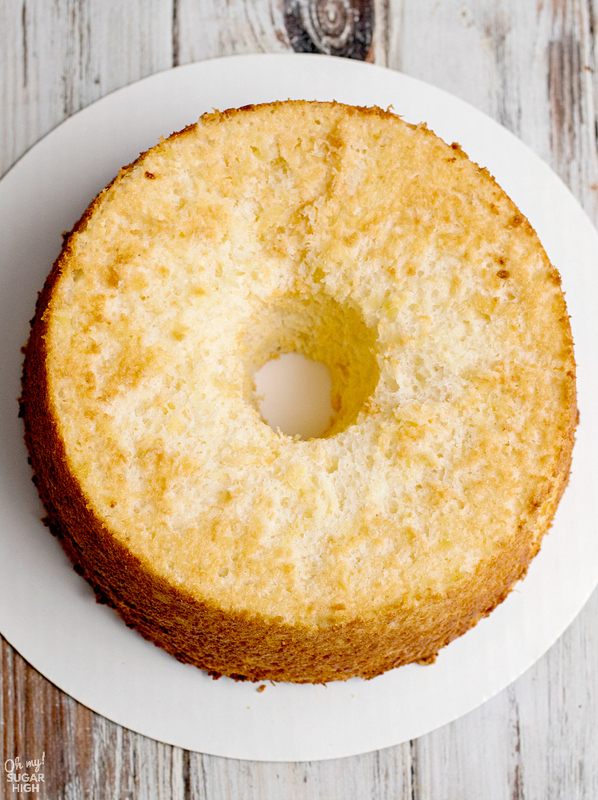 Only two ingredients are required to make this angel food cake with pineapple. You can skip the crushed pineapple topping and enjoy this light cake with chopped fresh fruit or a dollop of whipped cream. So many possibilities! 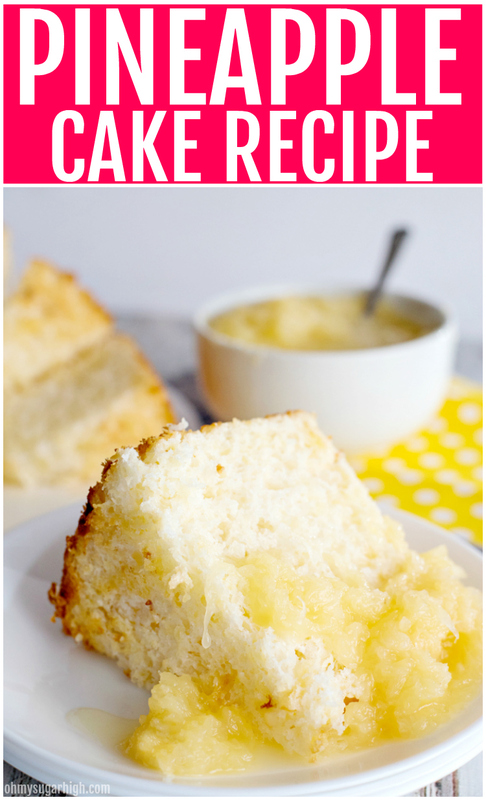 This pineapple angel food cake recipe is only 160 calories and 5 Weight Watchers SmartPoints when eaten plain. There are many different recipes for pineapple cake. 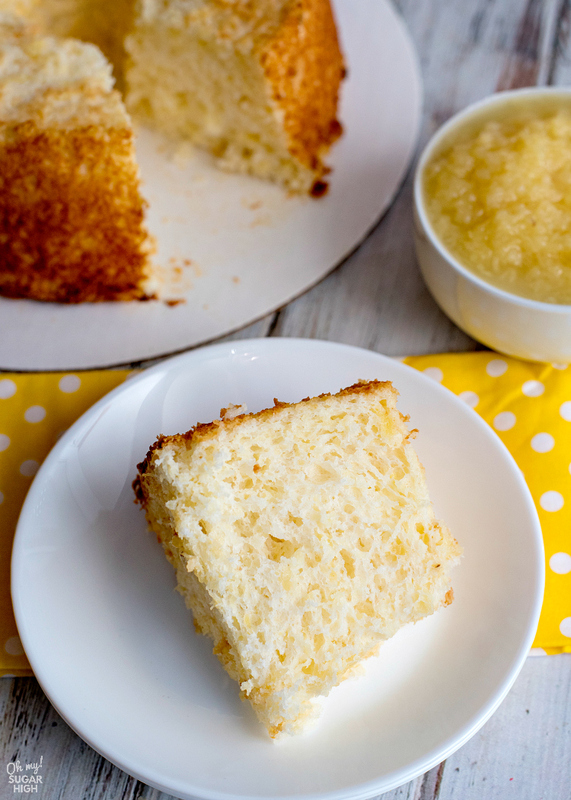 This one, also known as pineapple angel food cake, is extra easy as it only requires two ingredients: crushed pineapple and a box of angel food cake mix. Yes, it really is that easy! 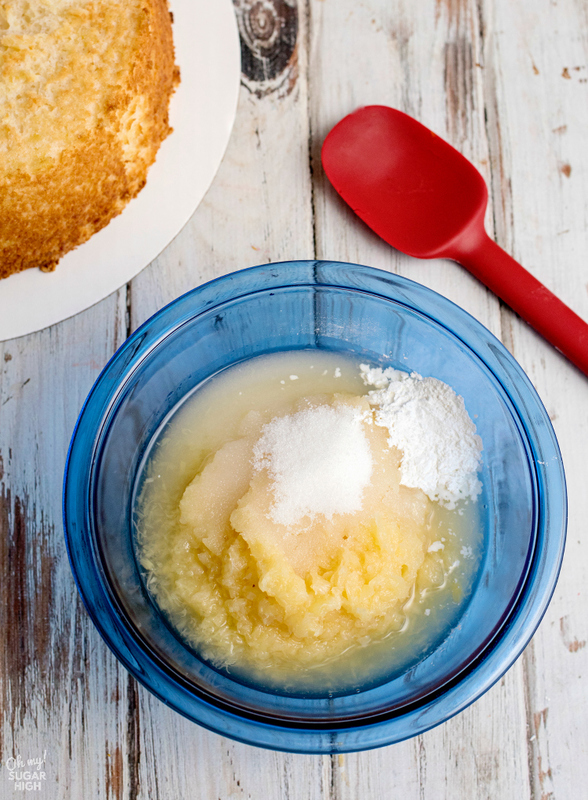 If you want to make the dessert topping that is included in this recipe, you’ll need an extra can of crushed pineapple, extra sugar to break it down and sweeten it further plus cornstarch to thicken it. To make this cake you’ll need a fluted tube pan. DO NOT GREASE THE TUBE PAN. This is very important as your pineapple angel food cake won’t rise properly because it will stick to the pan. When I first tried Weight Watchers (now WW) it was just before I had kids. I went to meetings religiously and shared in the journey with a close co-worker. It was definitely a success for me and I lost 25 pounds. I loved the versatility of the program and found that the point system really helped me to make smarter choices including what I ate and portion control. While this cake isn’t only for people following Weight Watchers, it does fit well into the program. This recipe includes 12 servings. 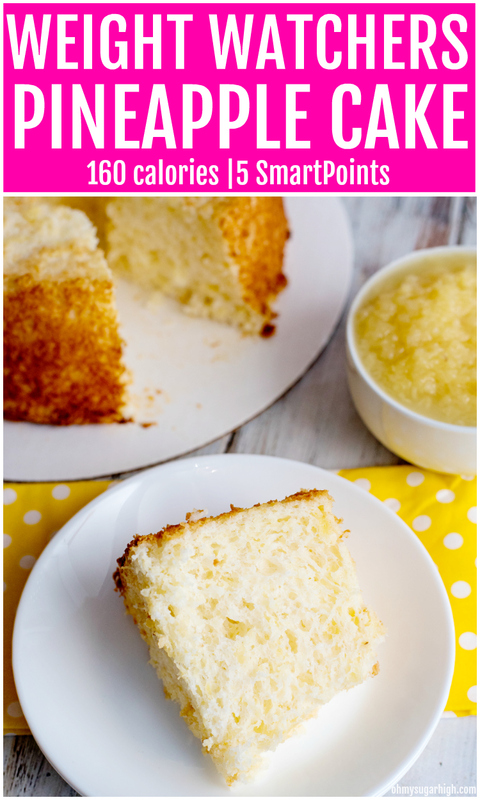 If you eat the cake plain it is 5 SmartPoints and 160 calories. The topping will definitely add points because of all the sugar. Skip it and instead have sliced fresh fruit such as berries and a dollop of light whipped cream or whipped topping. To make the pineapple topping, simply mix together a can of crushed pineapple, sugar and cornstarch. 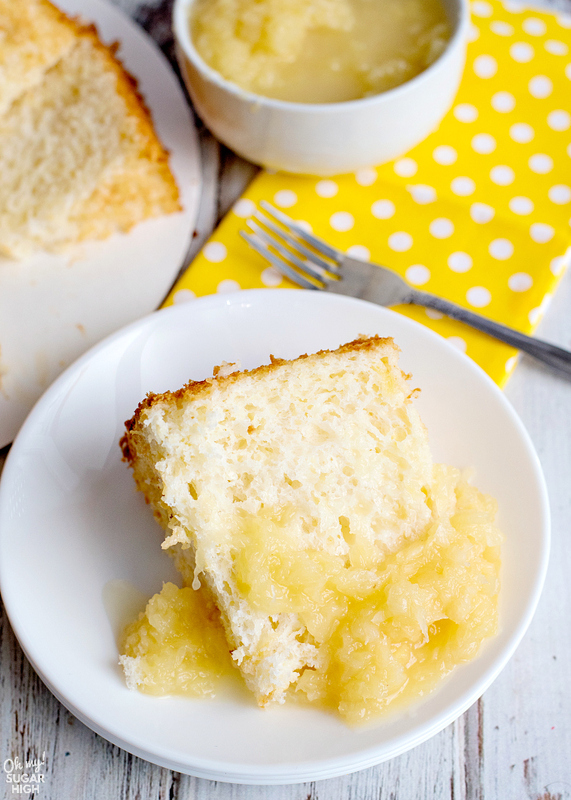 Top your pineapple angel food cake with this dessert topping for a scrumptious treat! If you really want to take it to the next level, add fresh whipped cream or a small scoop of vanilla ice cream to the top. 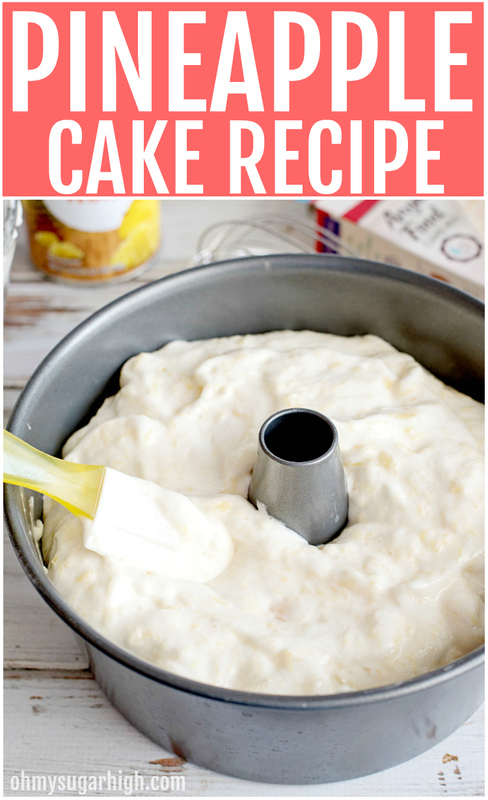 In a large bowl, beat crushed pineapple (undrained) and cake mix on medium speed for about 1 minute. Spread batter evenly into an ungreased 10 inch angel food tube pan. 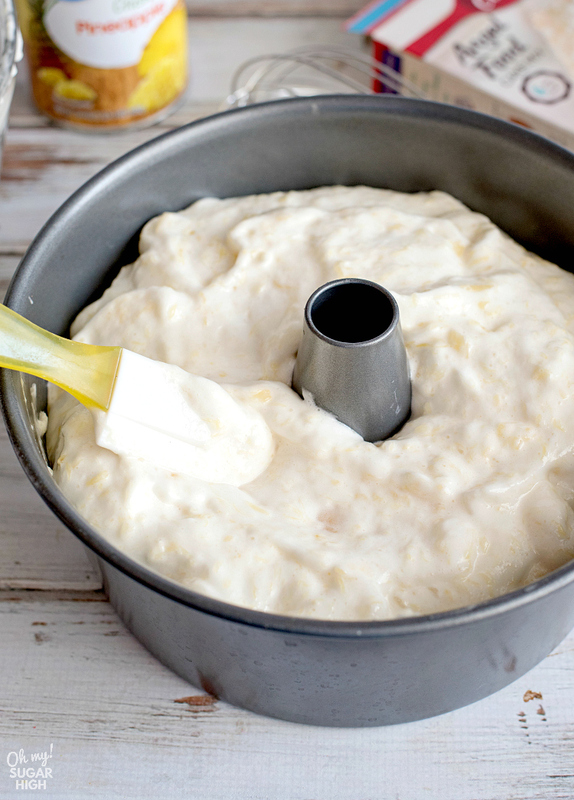 To remove from the pan, slide a narrow spatula or butter knife gently down the sides of the cake and remove the middle insert. Then, slide your knife around the middle section of the cake to release it from the pan. 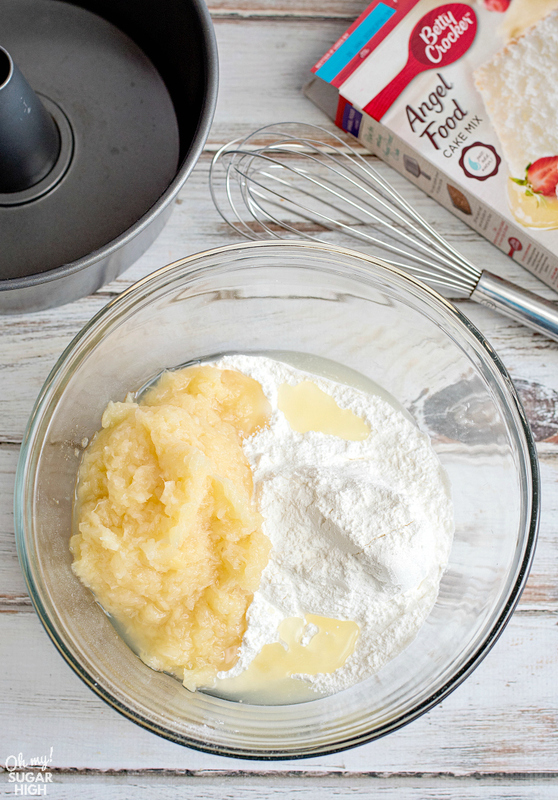 Whisk all dessert topping ingredients together. Pour into a medium saucepan and simmer over medium-low heat for a few minutes to thicken up the sauce. Allow the sauce to cool and chill for a little bit. 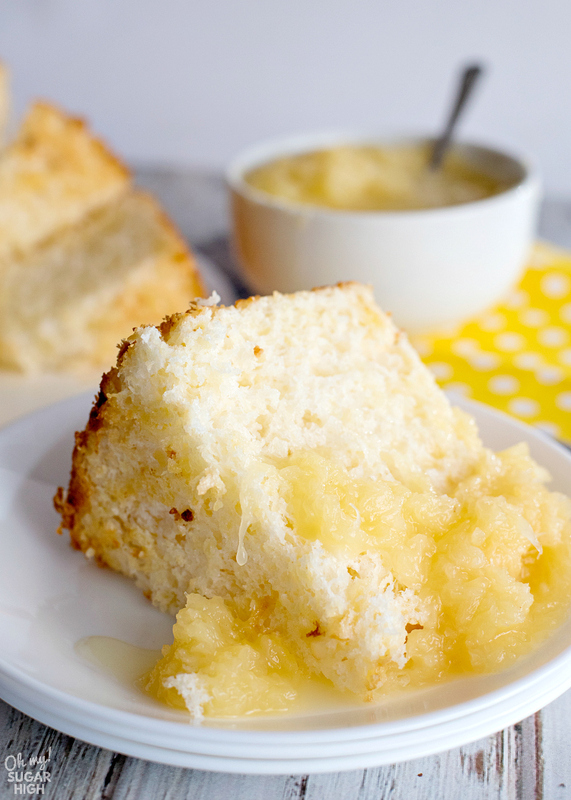 To serve, slice angel food cake and top with pineapple topping. Looking for more Weight Watchers friendly desserts? Here are some more great ideas. Be sure to calculate points based on the specific products you use.